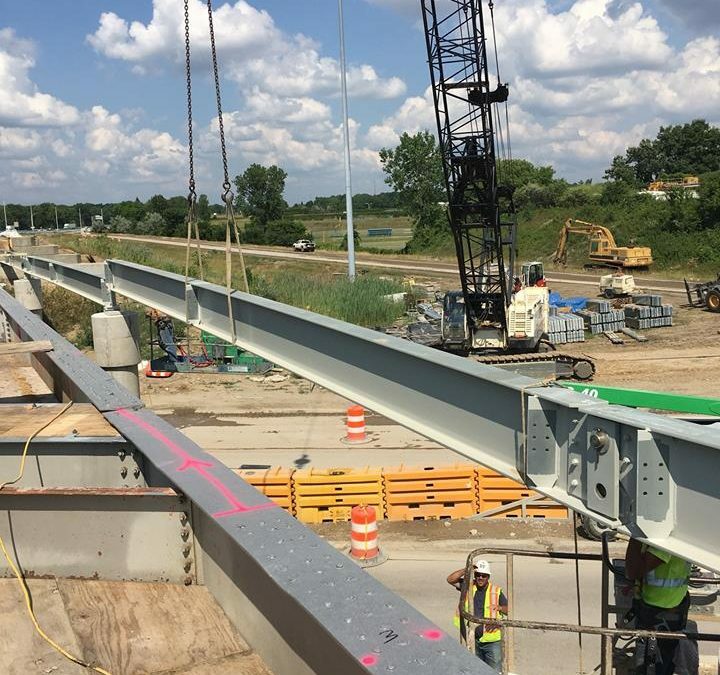 In July, crews set bridge beams on EB I-69 over Hammerberg Road in Genesee County, Michigan. Photo: Michigan Dept. of Transportation. A dispute between the Michigan Infrastructure & Transportation Association (MITA) and the Operating Engineers Local 324 has resulted in a labor lockout that has shut down, or slowed, hundreds of road projects in the state. The union’s five-year contract expired on June 1, since which time it has refused to negotiate with contractors. “The industry is very unified and standing firm against very disruptive, egregious activities that have been going on for quite some time, all summer long in fact. The union refused to meet,” said MITA Executive Vice President Mike Nystrom. MITA said work would continue on some construction projects across the state but may be halted on others. The Michigan Department of Transportation, which was notified of the impact, issued a statement saying it is not a party to the negotiations. “Our priorities remain the safety of workers and the traveling public and maintaining traffic to alleviate delays as much as possible,” the MDOT statement said. For any projects that are shuttered, the agency noted the contractor must still maintain a safe work zone. MDOT may also grant a time extension to the contractor because of the labor dispute, but will not offer compensation for any related costs. According to MITA’s Nystrom, a big concern for the industry is that the union’s tactics could be replicated in other states. “This could be a game plan that could spread nationally. This is affecting hundreds of jobs and thousands of employees,” Nystrom said. He referenced the union’s attempt to negotiate separate agreements with individual contractors rather than a multi-employer collective bargaining agreement. Operating Engineers Local 324 represents 14,000 members, including heavy equipment operators on road construction projects. The lockout will end when the union accepts and ratifies the industry proposed contract, which Nystrom said includes a 2.7 percent wage increase each year for five years. News reports said more than 160 state and local road construction projects across the state were in partial or full shutdown due to the lockout, including major highway projects on I-696, I-75 and I-96. About 80 percent of active road contracts across the state have been awarded to companies represented by MITA. On Sept. 13, Gov. Rick Snyder called on the parties to meet and find a way to resolve their differences quickly “before any projects are significantly delayed.” Snyder said in a statement he was consulting with the state’s Attorney General to provide guidance on the situation. More information can be found on the www.michiganinfrastructurelabornegotiations.com/ website.